Victoria's dolphin brooch at the photography of queen Silvia's 60th birthday 2003. It's hard to tell as neither event has really good photos, but it does look the same to me. This tiara looks good when the hair is puffed up, or with a gorgeous and intricate hairstyle, but with flat hair like that it does not make a fine figure. Great that she is wearing the Laurel Wreath Tiara again, I've been waiting for to see her wearing it. She looks great, I hope that she wears this tiara more often now. I think it looks nice on her and, as Lady Finn, I wish she wore it more often. Its really beautiful tiara that needs to be worn more often. Loved it on Princess Lilian, love it on Crown Princess Victoria as well. Does it solely belong to Victoria now? Yes. It was a private piece of Lilian's and she left it and another unidentified tiara to Victoria in her will. Victoria is perfection. Dress. Jewels. She looks stunning!!! Well, as I previously said in my post, I think that that tiara looks good with a more sprayed hairstyle. 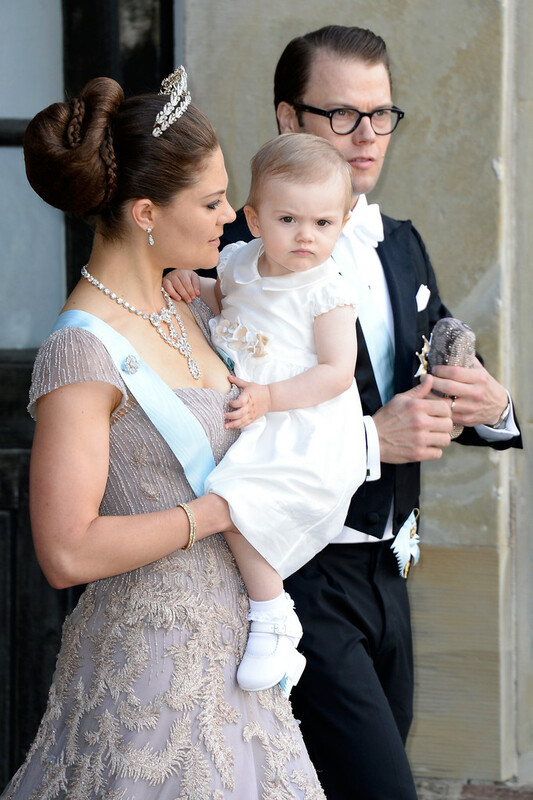 I liked how the tiara stood out on princess Madeleine's wedding day. That hairstyle was gorgeous. Thi time I was not impressed at all. Middle-parted hair does not flatter Victoria one bit. Love her in this tiara, with any kind of hair. Really suits her face. Victoria had today at the christening at her right hand a ring which I don't remember having seen before. She has sometimes used a Kreuger Jewellery ring on that finger, but this isn't it, at least it doesn't look like it. Maybe a gift from Daniel for the birth of their children? An eternity ring present? It might be. I found a photo of Victoria wearing the ring also on 10th May at the official photos with the president of Chile. About Victoria's watches, she normally uses the Epoch Lady Chronograph Diamond watch which she got as a 30th birthday present. But lately she has been wearing sometimes this Omega watch. About the brooch which according to the press Victoria has got from princess Lilian and prince Bertil, which she had at her engagement publishing and which she uses a lot. When did she get it? Here is a photo of princess Lilian on 1st October 2002 at the opening of the Parliament with the brooch. So far this is the only photo I have seen Lilian wearing the brooch. It seems that Victoria got the brooch from Lilian.